Posted on August 22, 2015	by Frank A. Have you been to a public skating session or skate school before? Have you ever wondered about speed skating or thought about trying it? Did you watch the 2018 Olympic Winter Games and thought ‘that looks cool’? Well, you can try it for FREE for four weeks with absolutely no outlay at all! That’s right, not one single cent to spend, no gimmicks, just come and try our great sport and see if you like it. All you need is some long pants (like tracksuit pants), a long sleeve top or jacket, a bicycle helmet and a pair of gloves (we do have spares, but it is always nice to have your own). A pair of socks that completely cover your ankles are also recommended. We train every Saturday morning between 8am and 9:30am at Xtreme Ice Arena, Mirrabooka and each Sunday morning between 7am and 8:30am at Cockburn Ice Arena, Bibra Lake and we welcome new skaters almost every weekend (except if it is a race day or we are away competing). We are a friendly club and we don’t put any pressure on new skaters – just come and try and see if you like it. Our coaches volunteer their time and there are no associated coaching fees to pay. Come and try this Saturday or Sunday, but please give us a call or an email to let us know you want to come and try and we will try and have a pair of speed skates to fit you. Come on! What have you got to lose? Posted on July 4, 2014	by Frank A. At the Western Flames Ice Racing Club, we value all our members, but especially the girls. In Australia, there are great opportunities for girls to really make and impact on the sport of short track speed skating because the numbers are low. At present, females make up about a third of our national skating membership numbers. At the WFIRC, we want to change that and build a strong team of girls on here on the west coast. We are well on our way – we have almost a 50/50 ratio of males to females, but we want more! WA has NEVER had a Junior or Senior National representative in a World Cup, World Championship or Olympic Winter Games, and we want to change that. Do you want to be part of the journey in an exciting sport? Then why not try for 4-weeks, absolutely FREE! That’s right, you pay nothing at all for 4-weeks. If you don’t like it, then there is nothing to pay. If you are interested in trying it out, please contact us to confirm your attendance. Positions are limited by group size so please be sure to call first. Training session are Sundays from 8:15am. You must be at the rink no later than 7;30am for your first session so we have enough time to get everyone set up. We hope to see you soon. Oh yeah, boys are also welcome! Posted on February 19, 2014	by Frank A. Come and try short track in Perth this weekend. We offer four weeks free to come and try – obligation free! This isn’t a trick; no hidden fees – just come give our friendly sport a go and see if you want to become a member of one of the fastest growing clubs in Australia. Contact us to find out what you need to bring to try. Posted on May 6, 2013	by Frank A. Check out the new promotional video for the Western Flames Ice Racing Club. If you haven’t tried speed skating and you would like to try something different, why not give ice speed skating a go? Do you want to know more about ice speed skating in Perth? Email Frank at Short Track WA and he will let you know how you can come and try our sport for free this weekend. Posted on March 20, 2013	by Frank A.
Sunday 17 March 2013 saw the last Healthway Sprint Series event held at Xtreme Ice Arena in Mirrabooka. The event drew the biggest numbers yet to a race day with 20 competitors. We also had first time racers in Brian, Titanda and Josh who all did really well in the novice division. 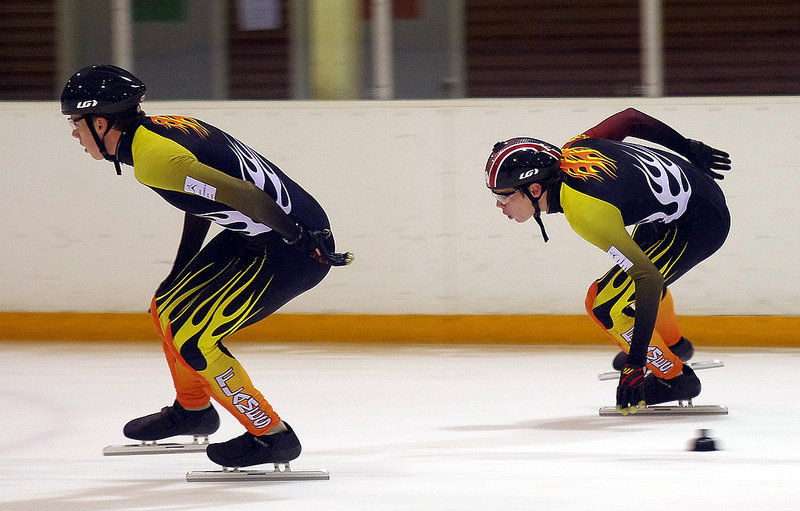 All skaters contested two sprint events in an ability based competition with several skaters posting season best times. The open division 1000m was won by Thomas Pilote with Frank Anderson a close second. In the 500m Thomas Pilote won the start but Frank Anderson took the lead with an early pass to win the distance. With the summer series of racing now completed, the club will be focussing on base training with more racing to commence in 6-weeks with longer distances becoming the focus. We look forward to seeing all members down at training over the coming weeks to continue working hard towards attending the 2013 Australian Short Track National Championships to be held in Melbourne on 30 and 31 August. Posted on October 4, 2012	by Frank A. Seven WA skaters from the Western Flames IRC have journeyed to Sydney for this weekend’s 2012 Australian Open Ice Racing Championships, to be held at Canterbury Ice Rink. Good luck to Ethan, Carys, Ashley, Chanel, Ryan, Mark and Frank for their races that start Friday morning. There will be no ice training in Perth until Sunday 14 October, when everyone will be back on the ice. Club racing will be held on 21 October, and the State Championships will be on the 17 and 18 November. The announcement for states will be out very shortly, and we encourage all levels to enter (there will be a novice division). Follow the Western Flames Ice Racing Club on Facebook. Posted on August 26, 2012	by Frank A. The official announcement for this year’s Australian National Championships has been released. Please note that there is a short closing date of 7 September 2012. Entries are welcome from all ISU Member nations. Click here >>>> for the link to the announcement and entry form. Get your entries in early. Posted on July 29, 2012	by Frank A.
WA has contested their second ever Duke Trophy event in Brisbane this weekend. Last year, six skaters travelled to Sydney to contest the same event and walked away with 989 points, finishing in fourth place. This year the team, with 8 skater managed to accumulate 1394 points with some good wins from Mark Chong and Frank Anderson. The other six skaters managed to gain some podium finishes with second and third placings. The greatest achievement was that every skater (except Old Man Frank) achieved new personal best times. Most skaters absolutely smashed their best times, with skaters like Ashley and Thomas taking almost 10 seconds off some distances. The Duke Trophy is a great development event for WA and we hope that within 2-3 years we will be within the top 3 rankings of the event, but we have some work ahead of us to keep up our development. Congratulations to all our skaters – we are proud of you. We will have some photos up soon. Posted on July 15, 2012	by Frank A.
WAISSA has named 8 skaters in their Duke Trophy Team for 2012. The Duke Trophy will be held in Boondall, Brisbane, QLD on 28 and 29 July. Last year, in their first ever attendance at the Duke Trophy, WA had six representatives and unfortunately, this year we had planned to have 13 skaters but due to a conflict in dates with an IHA tournament, we lost several skaters. From last year, we have Frank Anderson, Mark Chong, Emma Boughton-Lane and Ashley Anderson. New to the team this year for their first Duke Trophy event will be Ethan Thai, Carys Milby, Thomas Pilote and big brother, Laurent Pilote. 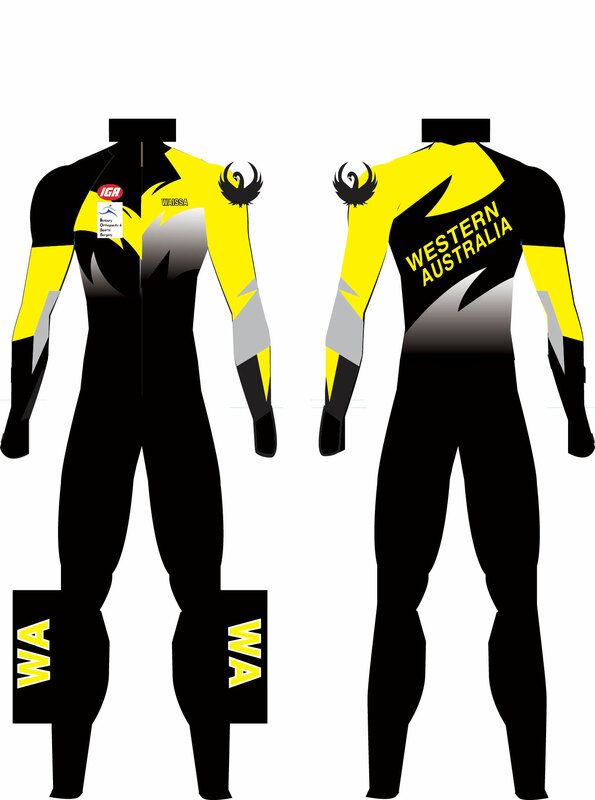 The skaters will take delivery of their new WA suits in the next week and we can’t wait to showcase them for the first time. Training had ramped up a little over the last month with some very tough sessions, and we have now started to ease off a little in preparation for the competition. Most of our skaters are still learning the sport and they have a lot left to learn. What they may lack in speed they make up for in their committment and devotion to be valuable members of our sport. Everyone is very excited that WA will be crossing the Nullabor again to compete in this great Australian Ice Racing event. Congratulations to all WA skaters. The 2011 Australian Open Short Track Championships were held at the world class Docklands Ice House in Melbourne. Nine WFIRC club members skated in the championships with fantastic overall results for the club. 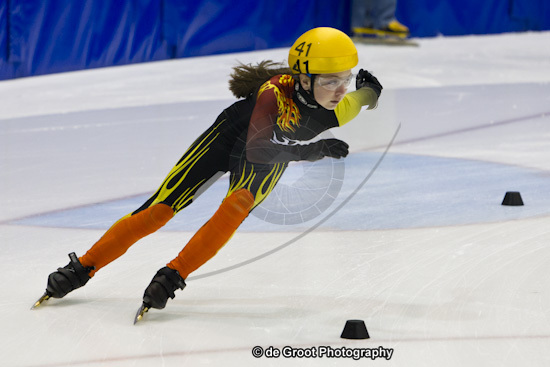 Madison Poole skated away with three new national records in the 222m, 333m, and the 777m distances. Madison was only beaten by New Zealand skaters but the racing was really close, with Madison being the equal highest placed WA/AUS skater in third overall in the Midget ladies division. Madison’s sister Courtney competed in the next division up, the sub-junior ladies. This was a large field and Courtney got into the swing of racing after her first race. Courtney missed the final of the 333m by just .001 of a second! And then her time in the B final of the 500m would’ve seen her in third place in the A final. Overall, with all new personal bests, Courtney finished 9th overall. Frank Anderson effectively threw away his title hopes after receiving a penalty (DQ) for a late pass in the 1000m Masters final. This meant that he did not receive any final points for that race. Frank backed up to set a new 35-39 years age record in the 3000m Super Final, finishing the competition in fourth place overall. When you consider that the top 4 skaters in this division were separated by 5 points, the 1000m penalty cost Frank the title. Better luck next year! Carys Milby was the only Nipper girl to skate the competition so she was put into the Nipper boys division and she didn’t disappoint. Carys also became the newest WA National record holder, establishing a new 777m record. Carys was awarded the 1st place for nipper girls, but becuase there was not three competitors, she cannot claim the National title. Carys raced well against the boys. Emma Boughton-Lane and Celeste Perhavec raced the Senior ladies division and ended up 8th and 9th Overall. Unfortunately, some results were mixed up and need to be clarified with AIR officials. Nonetheless, both ladies established clear personal bests in all distances. What was especially pleasing was to see them skate under the 1min mark for their 500m. And well under! Congratulations girls. Thomas Pilote contested the Junior mens division finishing 5th overall. Thomas had a fall in each of his first two races but came back with some good solid technical skating in his final two races. In those two races, Thomas established two new PB’s as well. 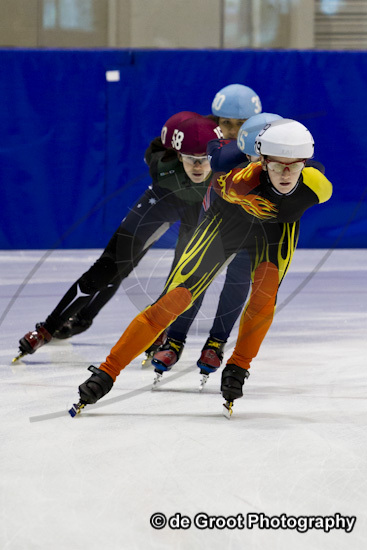 Thomas’s big brother Laurent was thrown into the premier division of Senior Mens, and although he was down the field in the sprint events, in the longer distances, he was not embarrased by any stretch of the imagination and he also skated to all new personal bests. Finally, Ryan Milby skated in the Midget Boys division also finishing on the podium, taking out third overall in the division and skating to all new personal bests. ryan got a good taste of racing tactics, and began thinking about the concept of drafting. Sometimes, this is easier said than done, but i know he had a fun time. WFIRC/WA State Coach Frank Anderson was awarded the AIR Club/State Coach of the Year Award by the Board of Australian Ice Racing. Frank could only have won such an award with the determination from the skaters, the assistance from the parents and the support of the Australian Ice Racing community. He also needs to thank the club sponsor of ACPL who without their genorosity, WA Short Track would not be on the map. Madison Poole was awarded her National Record pins from when she broke the 222m and 333m at the Duke Trophy in Sydney earlier this year. Although the year is not over, the results achieved by WA and WFIRC members this season have surprised a lot of people and it is expected that we will continue the promotion of our sport here in WA over the coming months, with our first State Championship planned for late November. It is time to do more recruiting to build our sport and competition on a local level – now that we have our own local heroes! GO FLAMES!